The results are in: New Zealand will not be changing its flag to the proposed fern-based design. At least not this year. But if the vote was 'yes' for a new flag, what would it have meant for the Flag for New Zealand emoji? Above: Proposed and Current New Zealand Flags. If the New Zealand flag changed, the Zealand flag emoji would have changed too. Had New Zealand voted to change its flag this year, the new design would replace the old one. Those emojis that look like little Australian flags up there will only keep looking this way while it's the current country flag. Above: How the iOS emoji keyboard might look in an alternate universe. A mechanism doesn't exist in the Unicode Standard to keep historic country flags. This rules out keeping old flag designs as distinct emoji characters. Flags are a bit of an exception in the emoji landscape. While most regular emojis need approval from the Unicode Consortium, flags do not. If a new nation were to come along today, the key to getting an emoji flag isn't by submitting a proposal to the Unicode Emoji Subcommittee: it's to be recognized as a nation first. Without getting tangled discussing who or what counts as a country, the short answer is that emoji flags are generated using the two-letter country codes specified in ISO 3166. Get listed in ISO 3166, and you're on the way to getting an emoji flag. As with other emojis, each emoji font vendor is responsible for designing its own images. 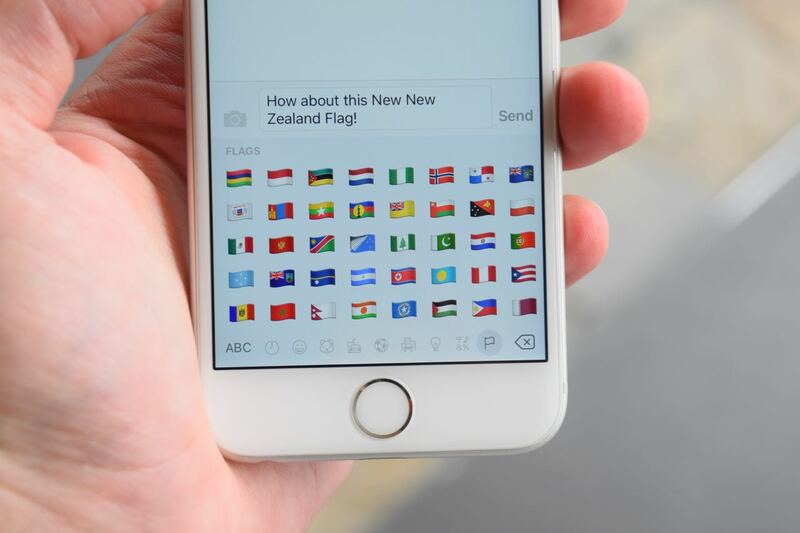 Left—Right: Flag for New Zealand as displayed by Apple, Google, Twitter, and Emoji One. 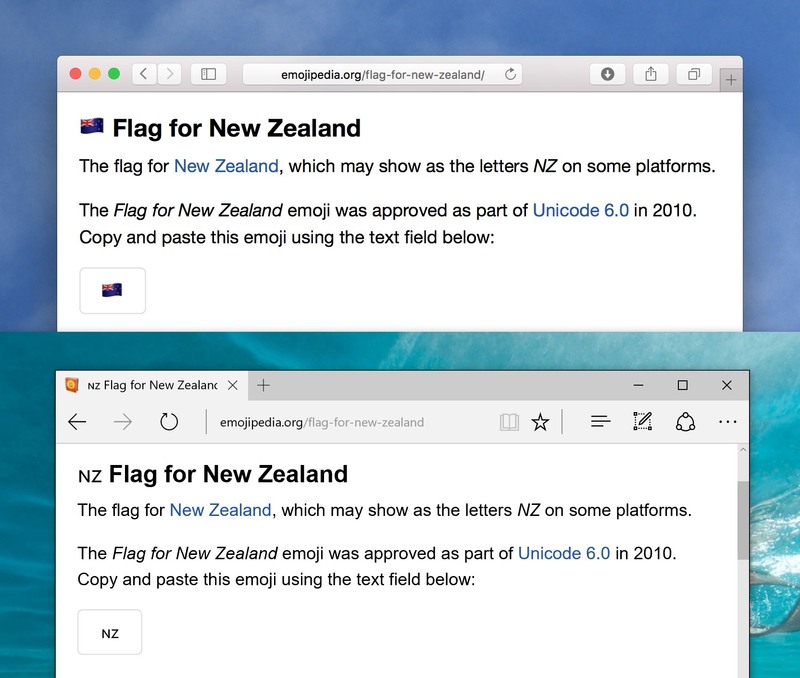 If a "yes" vote for flag change went ahead, vendors such as Apple or Google would have likely issued a point-release of iOS or Android including the updated New Zealand Flag image. 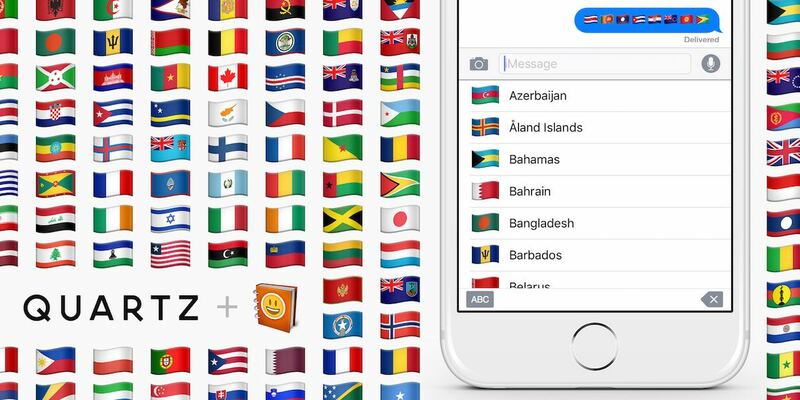 The only emoji changes in iOS 9.0 were the addition of new country flags. Above: A software update is required to change any emoji image. Platforms such as Twitter can roll out changes to Twemoji whenever they see fit, as the images are stored server-side. Apps that use native emojis (instead of images) would all automatically get the new flag shown when the operating system updates it. Even our flags emoji keyboard app wouldn't need an update, as it uses native emojis from iOS. Above: Yes, this was an excuse to plug the free, cool, Quartz-Emojipedia flags emoji keyboard app. Don't mix up those flags. You might have noticed that I didn't mention Microsoft or Samsung in the list of vendors up there. Neither Windows or the Galaxy series phones include any emoji country flags. They only display the regional indicator symbols where others see a flag. When sending a flag to a Windows or Samsung user, be aware that your patriotism may not shine through as boldly as you hope. This effectively gives both Microsoft and Samsung a free pass on the issue of emoji flag changes. Above: Flags are supported on OS X (top), but not Windows 10 (bottom). I can't write an article about flag emojis without an inbox full of "requests" for a Scottish Flag emoji. Plans are underway to allow England, Scotland, and Wales their own emoji flags outside of the Flag for United Kingdom. 2016: a big year for flag emoji enthusiasts.